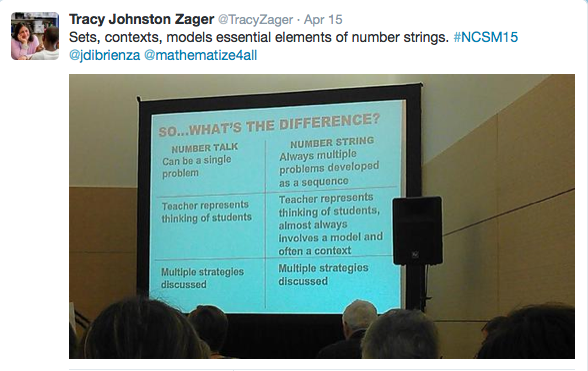 When I first saw this image, I have to admit, it didn’t match what I had been calling a Number Talk in my classroom. Having started my journey with Number Talks with Parrish’s book, I saw it as a string of problems with a specific strategy as the focus of the string that got progressively more difficult (which sounds more like a string in reading this slide). As I started creating my own and making variations to them over the past couple of years, I have simply started calling them Math Routines….it was just easier than trying to make things fit into a certain framework in my brain. After going back and forth about terminology, I started looking at these structures more in the sense of purpose than the name and I am finding it very interesting. Please keep in mind as you read, this is completely from my experience with Math Routines in the classroom and I find all of these talks so incredibly valuable! First comparison: Single problem vs string of problems. In my experience, I think these two designs have a substantial difference in purpose. When I give one problem, I am going for one of two things: a variety of strategies to see where students are in their thinking OR connections/comparisons of multiple strategies. Personally, I like the variety of strategies before and after we have investigated different ideas that could impact their thinking. For both the students and myself, it shows growth and I can use what I find to help me in planning future routines. Connecting and comparing takes a bit longer and, for me, I don’t get as many strategies out because we focus on connecting and comparing only a few for time’s sake. Second comparison: Difference in having a representation and context. I don’t give a representation or context unless a student brings one up in a explanation. If it comes from them, I go with it, if it doesn’t, I don’t write it up there. If there is a specific representation I am hoping comes up because we have been doing work with it during our math class, but doesn’t, I do have them do a quick journal response. I will ask them something such as, “How was our number talk similar to or different from our work in math class this week?” Then I can read their journals and have some students share the next day about the representation connection they made. I also have had students create contexts after we finish a number talk with a prompt such as, “Write a context that you think fits one of the problems in the string. How does the context change for another problem in the string?” For example if the string has “16 x 4” followed by “16 x 8” I am hoping to see connections between the two problems in the context. Nothing to compare in the final piece, multiple strategies discussed in both! In the end, students are talking math with a mathematical purpose so they are win/wins in my book, but I am curious to hear what others think around the purposes of different formats of these routines! Would love to hear other ideas so comment away! This entry was posted in number routines, Number Talks and tagged number routine, Number Talks on June 24, 2015 by mathmindsblog.